Flexible, Adaptable & Convertible! The Switch-n-Click mousing platform not only swivels and tilts independently it can be placed at two different heights and three different positions to meet the individual needs of each user. Our new mounting hardware allows for easy repositioning of the mouse from left to right side of the platform - no tools required! 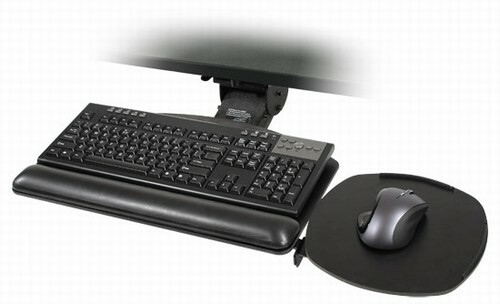 Mouse Forward - - Mouse can be positioned closer to the body for improved ergonomic comfort at either Mouse Above height or platform height. Mouse Over -- Mouse can be positioned over the 10-key to decrease reach. Mouse in Line -- Mouse can be positioned in direct line with the keyboard at either Mouse Above height or platform height. 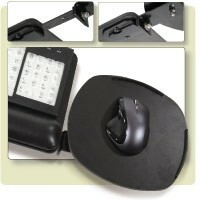 Leatherette covered Gel Palm Rests are now standard on all platforms at no additional cost. Over 90 square inches of mousing area!